1780 Fanning-Harris house, Sterling Harbor - charming, waterviews, great karma! Nestled on peaceful Sterling Harbor in the historic district of the village, the house was built by David Fanning around 1780 and owned by the Daniel Harris family, patriots during the Revolutionary War. Built in the vernacular style of the period and nicknamed "Crik-Crak," the house has been renovated lovingly to keep its architectural character intact -- with original wood-beamed ceilings, wide floorboards, and 2 working fireplaces. An eclectic mix of antiques, Chinese and modern furniture with folk art lend charm to the interior with its spacious, open flow. The seven-room house has 3 bedrooms -- master bedroom with fireplace on the first floor and two bedrooms on the second floor (one large queen bedroom and a single guestroom) -- and 2 full baths with showers & tubs (one recently updated). There is a cook's kitchen, renovated with state-of-the-art appliances, a gracious dining room, a library/foyer with working fireplace and daybed, and a large and airy sunroom. This "family room" opens to the front porch and deck with pergola and flowering vines, perfect for relaxing or entertaining amidst waterviews. The kitchen leads to the outside patio for intimate dining, side yard with arbor and gardens, and shower for when one returns from the beach. The property (one-quarter acre) is located on the village's most desirable street. It combines privacy and a country feel with easy access by foot (5-min) or bike to all village amenities -- restaurants, cafes, markets, bakery, movie theater, carousel.... White sand 'n' pebble beaches on Long Island Sound and Peconic Bay are within a short walking, biking, or driving distance. Boat slips can be rented on the waterfront side of the street; a public dock at the end is used for launching small boats and kayaks in Sterling Basin. A 2-hour drive from New York City, Greenport is also served by train (LIRR), private bus (Hampton Jitney), and the North Ferry to Shelter Island, the Hamptons, and Montauk. All transportation is within easy walking distance of the house. Cross Sound Ferry to New England is 8 miles away at Orient Point. Enjoy boating, sailing, fishing, swimming, tennis (public courts at the school), cycling, golf (Island's End Golf and Country Club); Monday night band concerts with picnics and dancing in Mitchell Park, North Fork Community Theater, wine-tasting events at local vineyards (30+), Audubon and Mashomack nature preserves; country fairs, house-and-garden tours, art openings, and auctions. Or just relax peacefully at "Crik-Crak." All linens are provided, including beach towels and kitchen linens. State-of-the art country kitchen with all amenities for cooking and baking. Dining room seats 8 people. There is also outdoor areas for dining on the deck/porch and patio. Public courts at the Greenport school. Public golf course in East Marion. Two weeks in this beautiful but spacious cottage flew by. Breakfast each morning on the deck, under the pergola, with a view of the inlet; nights in a four-poster bed; swordfish on the gas grill and dinners prepared in the fully equipped country kitchen; plenty of room for visiting adult children in the two extra bedrooms; a house full of light, charm, and tchotchkes from the owner's travels. The house is on a quiet street a 10-minute stroll along similarly sleepy streets to Greenport's bustling business district, restaurants, movie theater. You're not far from beaches, gorgeous bike rides, vineyards, and just 10 minutes from Shelter Island. Moreover, Greenport itself is a quaint haven of an historic whaling village, with not a Starbucks or fast-food franchise in sight. An ideal escape. 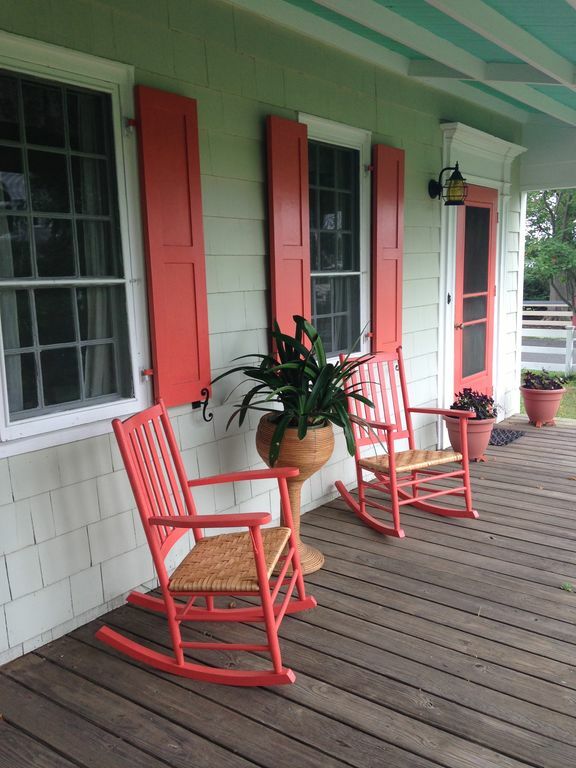 It's always nice to rent to people who love the house and appreciate its Caribbean charm. The couple was also one of the best and most considerate tenants to occupy the house who took advantage of all this quiet enclave and maritime village have to offer. Charming home in great location!! My husband and I rented this incredibly charming home for the month of August last year. It's nestled on a very quiet road with beautiful harbor views and is a few minutes walk from all the activities and amenites of Greenport village. The home is very spacious and has great outdoor living/dining spaces. We most definitely enjoyed our time her and would highly recommend it.